This is my absolute favorite, no-doubt-about-it chicken. Todd has grilled this in the rain in the middle of November in the dark because it’s so good. And because he’s a fantastic husband. Eat with kim chee and plenty of rice. One note is that the Sam Choy original recipe calls for quite a bit of fresh ginger. I didn’t like the edgy bite that the ginger gave, so I nixed it, and I’m much happier with the flavor balance. 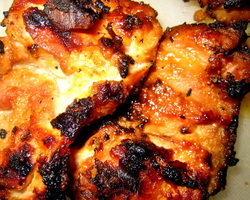 Mix everything together and marinate, ideally overnight, but at least a full afternoon. Grill. Baking or stove cooking just doesn’t do it for this one.